A clot blocks the blood flow to your brain. These are “ischemic” strokes. A blood vessel bursts or leaks in your brain. Doctors call this a “hemorrhagic” stroke. With either type of stroke, brain cells can’t live more than a few minutes without oxygen. 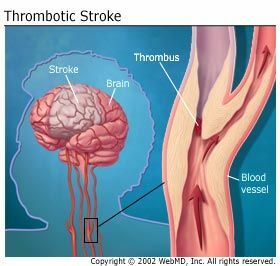 These are when a clot stops the blood traveling through a vessel in the brain or neck. Most strokes -- 80%-90% -- are this type. Doctors call these "ischemic" strokes." Some clots form inside a blood vessel and stay put, blocking blood flow in the brain. Doctors call this a “cerebral thrombosis.” The causes usually are high cholesterol and narrowed or hardened arteries that pump blood throughout the body. Sometimes, a clot dissolves or dislodges on its own. This is a transient ischemic attack, or TIA. Although TIAs don’t injure the brain permanently, you can’t tell whether it’s a TIA while it’s happening, so you must call 911 at the first symptoms. Never wait to see if they pass, or it may be too late for treatments to help. TIAs can also mean that you’re at risk for having a full-blown stroke later. This happens because of bleeding in the brain. 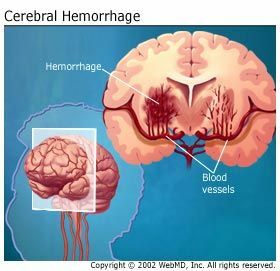 These "hemorrhagic" strokes are less common than the ischemic kind, but they can be more severe and deadlier. Most often, it happens after an aneurysm -- a thinned or weakened spot on an artery that has ballooned from pressure -- bursts. Other times, the artery wall grows brittle over time from fatty plaque and then breaks open. Strokes can happen at any age, even to babies in the womb. Still, the odds of a stroke climb quickly after middle age. Keep your blood pressure healthy. If you have high blood pressure (consistently over 130/80), this is the single biggest thing you can do to lower your odds of a stroke. Avoid tobacco. Smoking cigarettes and chewing tobacco -- even secondhand smoke -- cause physical changes in your body. They can thicken your blood and make it more likely to clot and cause fatty buildup in your arteries. Control your cholesterol levels. High levels of LDL, or "bad" cholesterol, make it more likely that plaque will build up in your arteries, putting you at greater risk of a clot that causes a heart attack or stroke. Manage diabetes, if you have it. 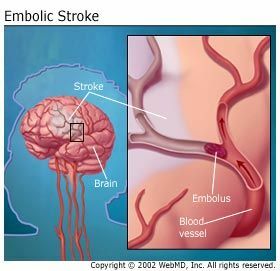 If it’s not under control, it can lead to a stroke by damaging your blood vessels. Check your weight and waist. Your doctor can let you know if these numbers are in a healthy range. if you have a belly that’s bigger than 40 inches around for men or more than 35 inches for women, that may be especially risky. Silbergleit, R. Academy of Emergency Medicine, 2005 Apr. Braunwld, E. (editor); et al, Harrison's Principles of Internal Medicine 16th Edition, McGraw-Hill Professional, July 23, 2004. Bendixen, B. and Ocava, L. Current Cardiology Report 2002, Mar. Berger C. Stroke. 2005, June. Roy, M. Journal of Association of Physicians of India, 2004, Dec.